The April edition of our Galician session / foliada is coming up next week, on Wed, 25.4., starting from 8:30pm, at the James Street Tavern as usual. In the tenth session in the new sequence, we’ll again play lots of lovely tunes from our vast collection of Galician traditionals. The Oxford Pandeireteiras will play their tambourines and sing some of the songs they practise in their weekly classes. Sheet music will be provided for anybody who brings an instrument and wants to join in. Feel free to dance if you find space to move. A bag of miscellaneous percussion instruments is also on hand if you would like to rattle along with the rhythms. This coming weekend, 20.-22.4 will of course see the amazing Folk Weekend Oxford, with lots of concerts, dance events and sessions. While there is no specifically Galician session in the programme, I can predict that some Galician tunes and songs will be played at the Open Session on Friday evening, 8pm till midnight, at the St. Aldates Tavern (first floor). Full programme for the weekend is here. Then, on Tue 1.5. 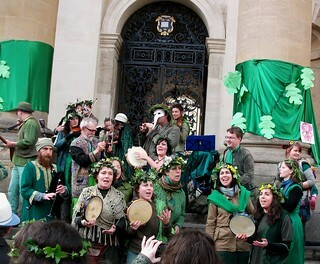 (May Morning) at some ridiculously early time like 6:30 am, the Oxford Pandeireteiras will be singing “O Maio” on the steps of the Clarendon Building, Broad Street, with the Whirly Band. Illustration from the Cantigas de Santa Maria (wikimedia). You are currently browsing the Galician Session Oxford blog archives for April, 2018.